The French production company La Machine has been producing urban operas since the early 1990s, and to put it simply: they’re stunning. Using wood, leather, copper, or glass, they create enormous mechanical marionettes with a surrealist bent and a bit of a steampunk aesthetic. (This is particularly noticeable in their Elephant marionette.) The movements are precise and that breaths life into the machines. These creations are then used in multi-day operatics with light, sound, steam, music, and even weather effects. I find myself awe inspired every time they perform. But you can just see for yourself in the videos below. It’s so cool. New bucket list item: see one of these productions in person. This year’s show was The Guardian of the Temple held in Toulouse, France—it was an interpretation of the myth of Ariadne, who helped Theseus defeat the Minotaur. Each production typically lasts through several acts played out through a city and performed over several days. You can learn more about La Machine on their website. (I’ll link to the English version.) Be sure to follow them on Facebook and Twitter. They also share much more content over on YouTube and on their Instagram. La Machine has upcoming shows scheduled for Nantes and Calais in France. I’m excited to see what they do next. For years I didn’t understand the steampunk community’s obsession with airships. I understood that they were transportation ephemera of a sort and that they harkened back to a bygone era, but I always thought they were too small. This was due in large part to my misunderstanding of their construction. I was further confused when I realized I didn’t understand how mooring masts worked. The giant spire atop the Empire State Building was initially designed to be a mooring mast, but I could never understand how passengers would get down from the gondola. Ropes? Ladders? Either way, it sounded like it would be dangerous. 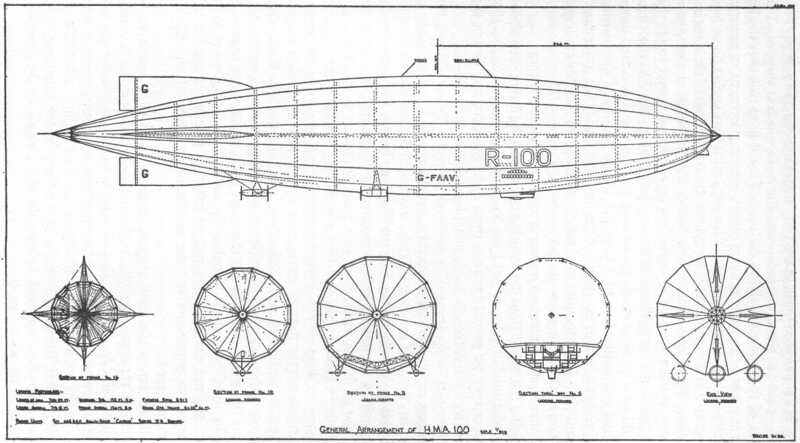 It wasn’t until I read Larry Correia’s novel Hard Magic in January that I decided to look further into dirigibles. His book utilizes them a great deal, but I was having a difficult time picturing the spaces described, so I began to research. It turns out my assumptions were very wrong. 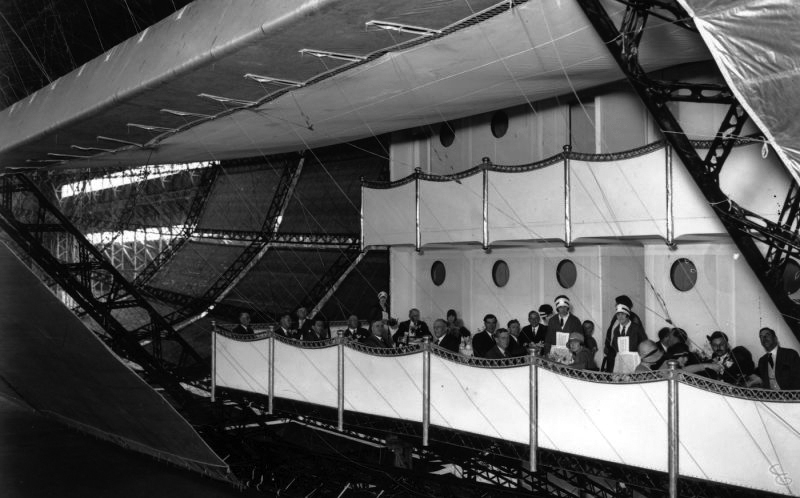 Airships had decks! 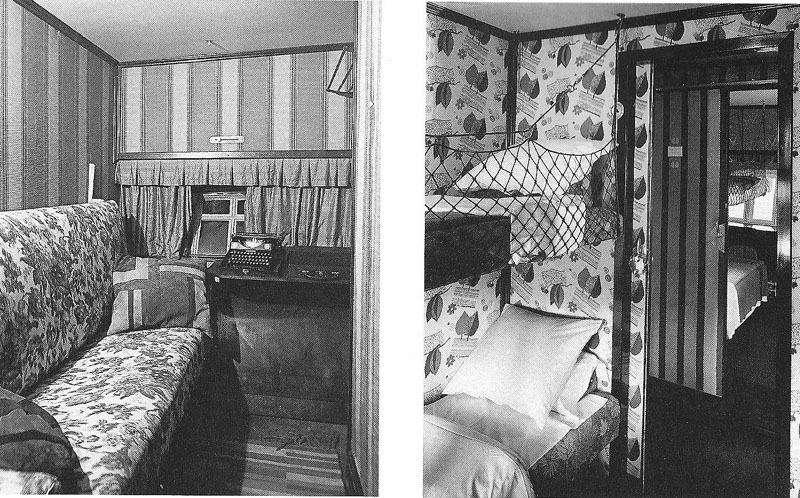 Passenger cabins! 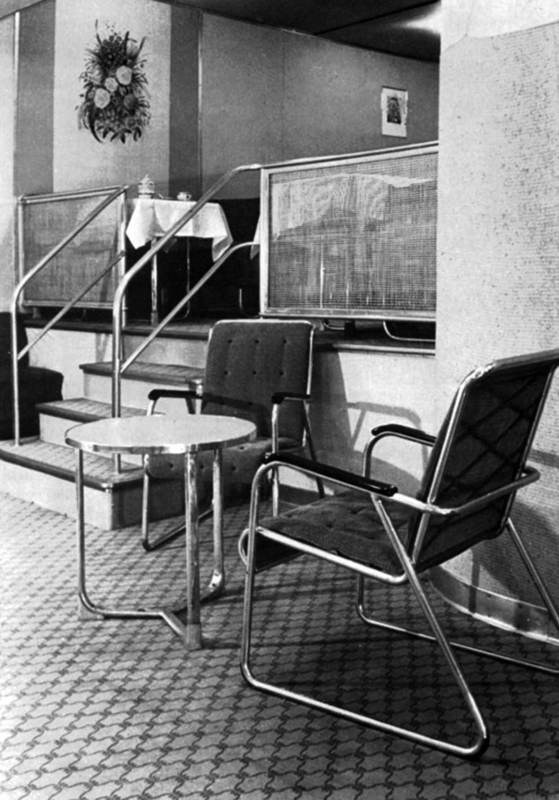 Lounges! Promenades! As I started asking my friends, I discovered that I wasn’t alone in my ignorance. I blame The Rocketeer. So where were these accommodations? This surprised me as well. 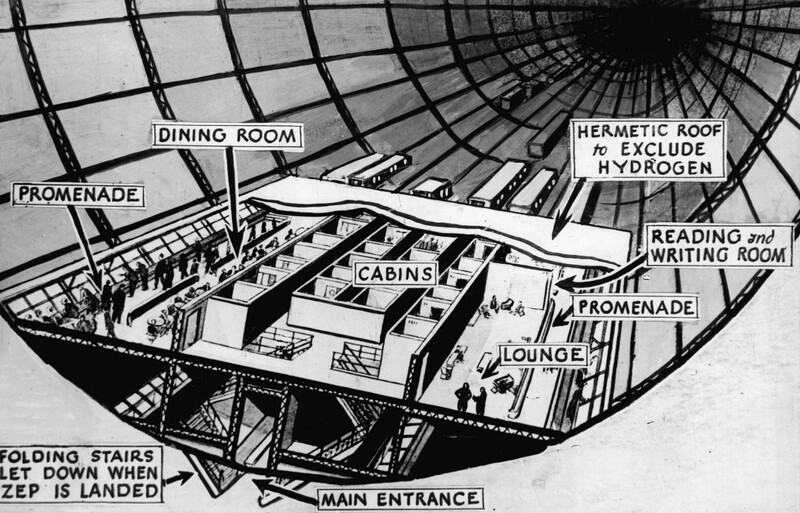 As the illustration below describes, they were most often inside the ridge frame of the airship itself. For years, I operated under the assumption that passengers were as crammed into the tight space of a gondola (similar to military dirigibles.) But the tiny gondolas that dangled below looked uncomfortable for a long flight across the Atlantic. It turns out they were the exact opposite of cramped. When I realized they had more in common with starships, ocean liners, and riverboats, my perspective changed. They became something much more, and I immediately understood the obsession. My research led me to The Airship Heritage Trust, which had a collection of images of the British R100, one of the premiere passenger airships of its day and similar in design to the famous Hindenburg. There you can find photos, ship plans, flight logs, and much more. If you’re looking for details, I highly recommend browsing that site. I was fascinated by the layout, and the passion began to make sense. 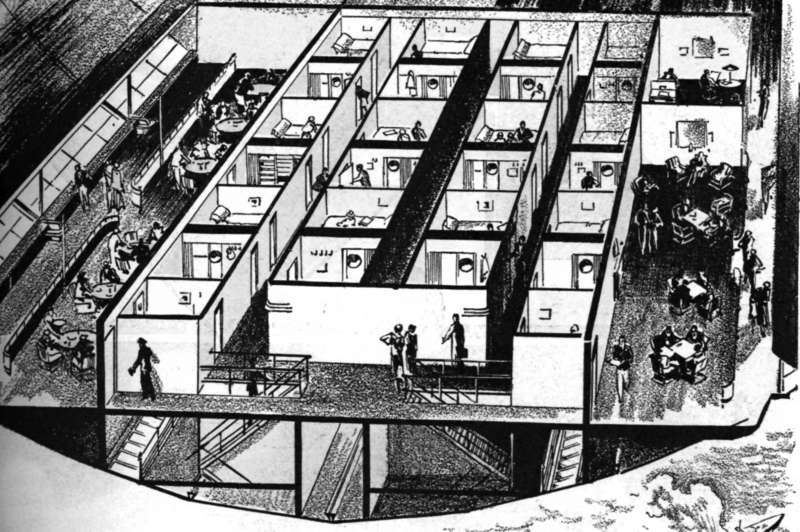 Below is a collection of images and some deck plans I have found relating to the interior and passenger spaces of airships. These come from the British R100 and R101 and the Nazi LZ 127 Graf Zeppelin, LZ 129 Hindenburg, and LZ 130 Graf Zeppelin II. 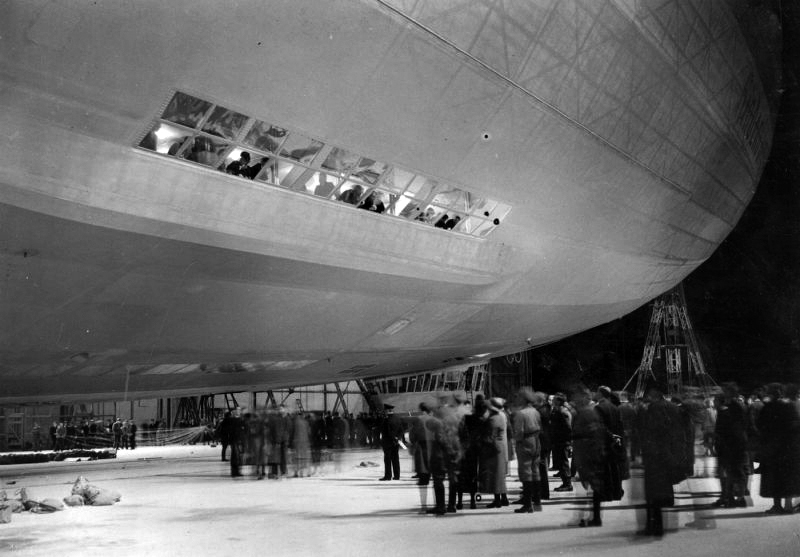 I also included a photo at the end showing passengers boarding the R101 so you can see how mooring masts worked. Makes a lot more sense than what I had in my head. In some cases, I did some minor color correction and cropping to give the gallery some unity. 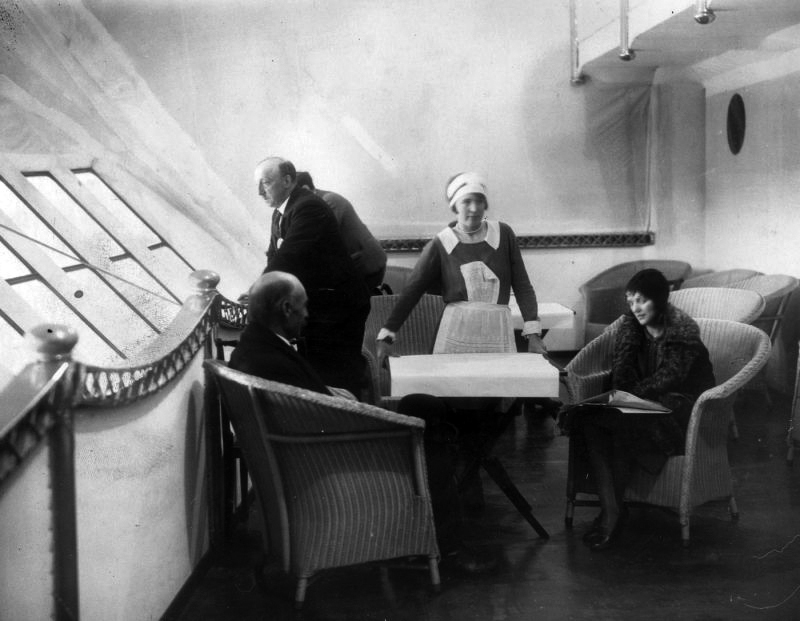 Maids in the main lounge of an R100. 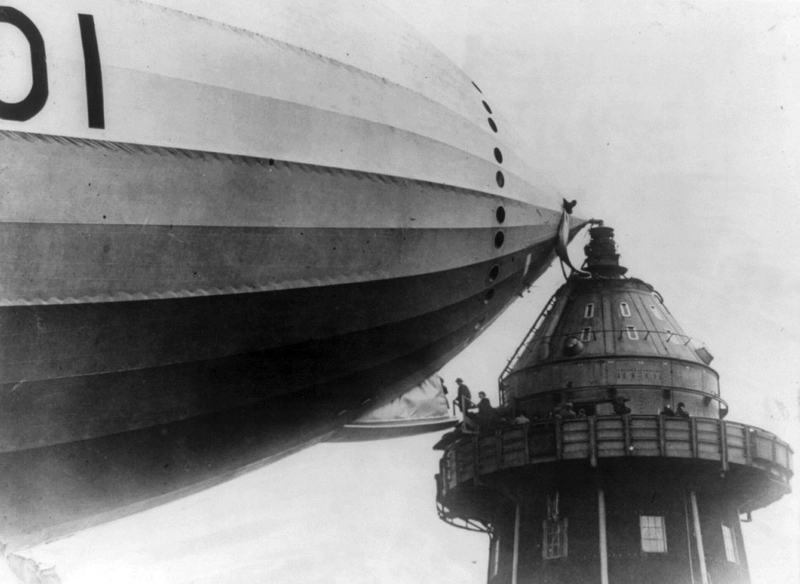 Passengers gathering outside the LZ 129 Hindenburg. Passengers on the promenade of the R100. 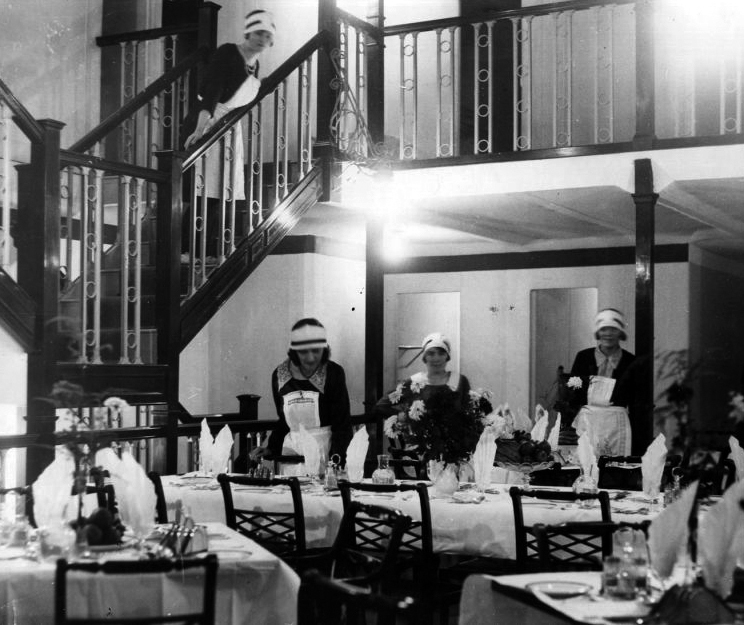 Diners at tea in the dining room of a half-built R100. 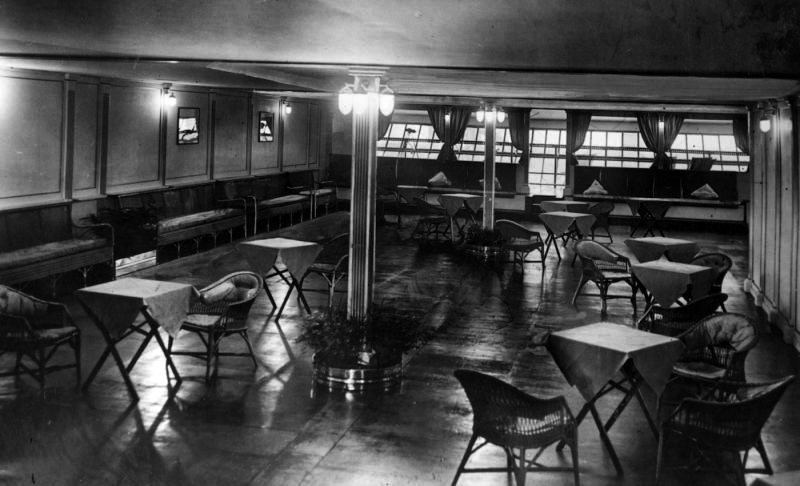 Main lounge of the R101. 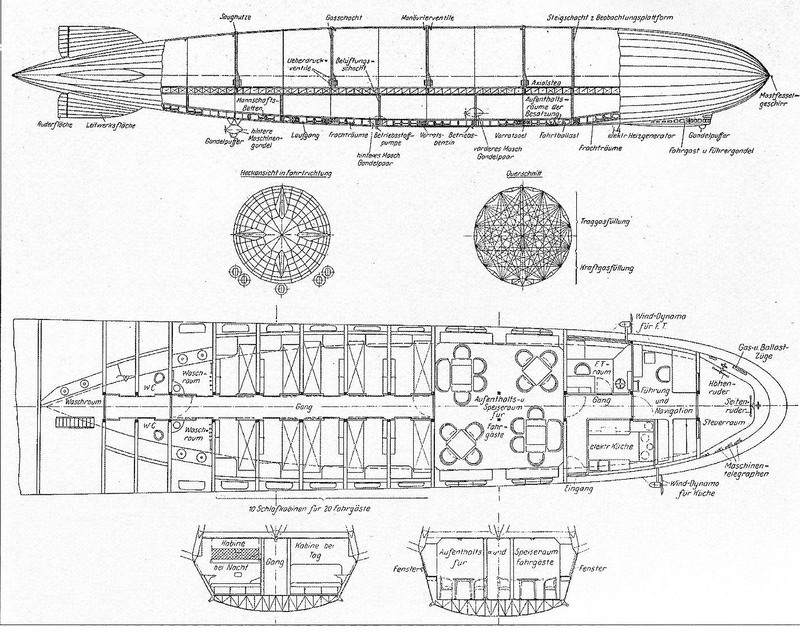 Cutaway of the LZ 129 Hindenburg. 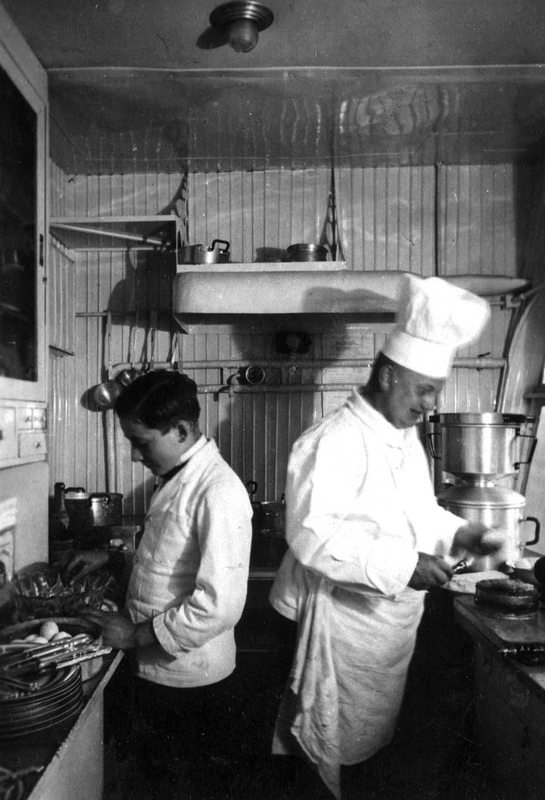 Kitchen onboard the LZ 127 Graf Zeppelin. 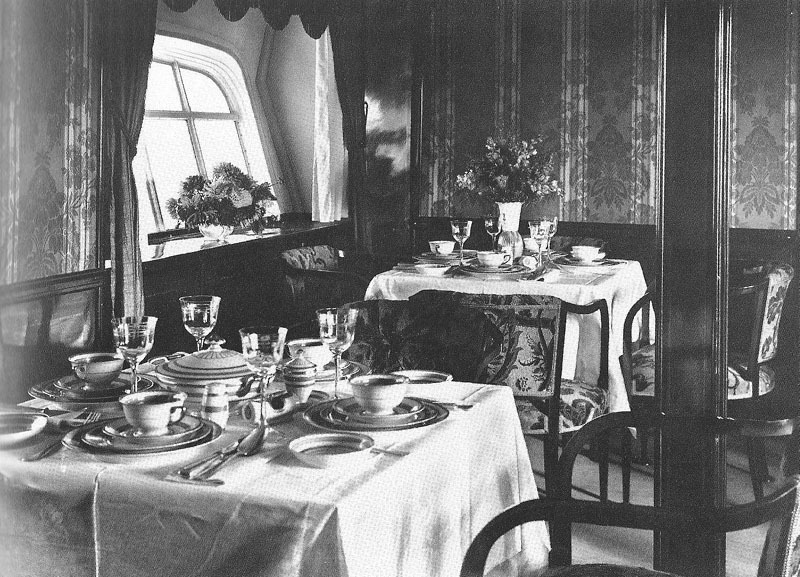 Dining room of the LZ 129 Hidenburg. 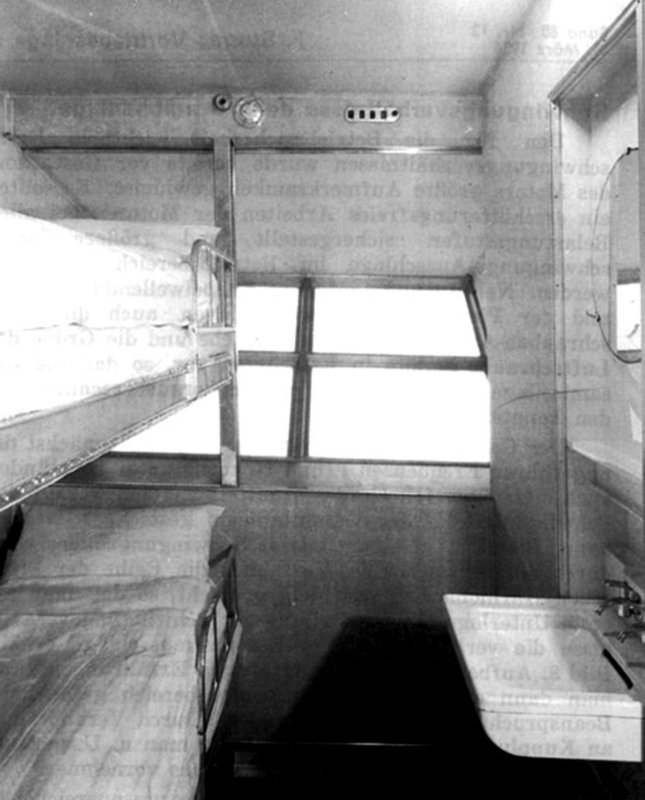 Passenger cabin on the LZ 127 Graf Zeppelin. 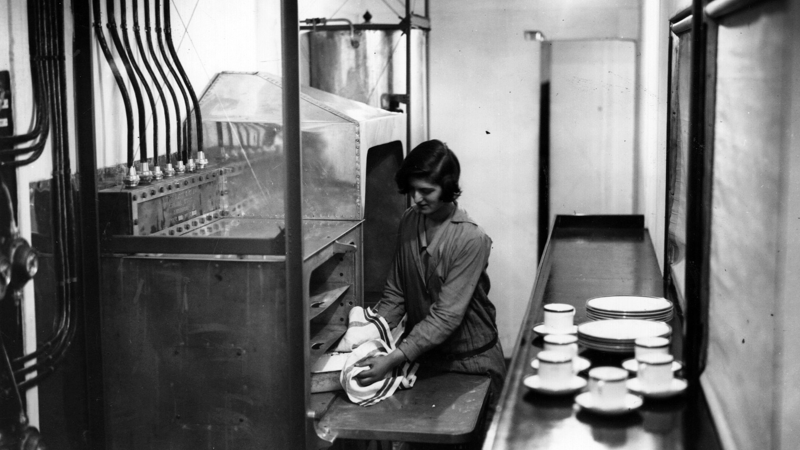 Maid prepares a meal in the kitchen of the R100. 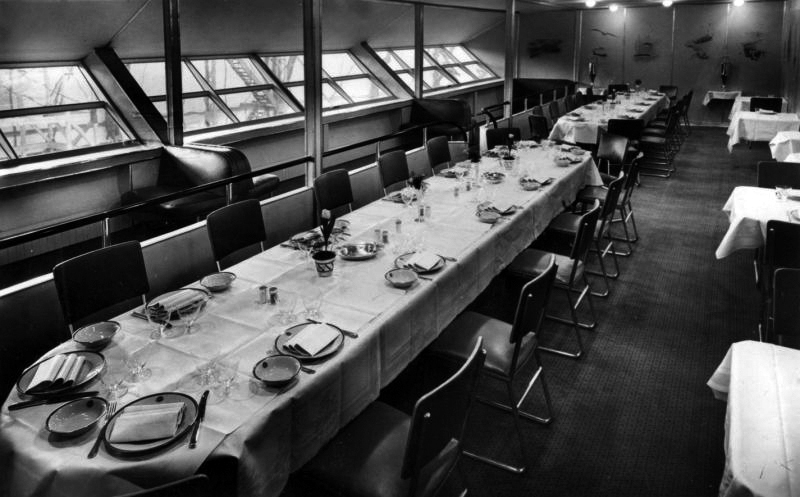 Dining room on the LZ 127 Graf Zeppelin. Another cutaway of the LZ 129 Hindenburg. [!] Note: While one of the most successful dirigibles, the LZ 127 Graf Zeppelin had a different layout than the others. 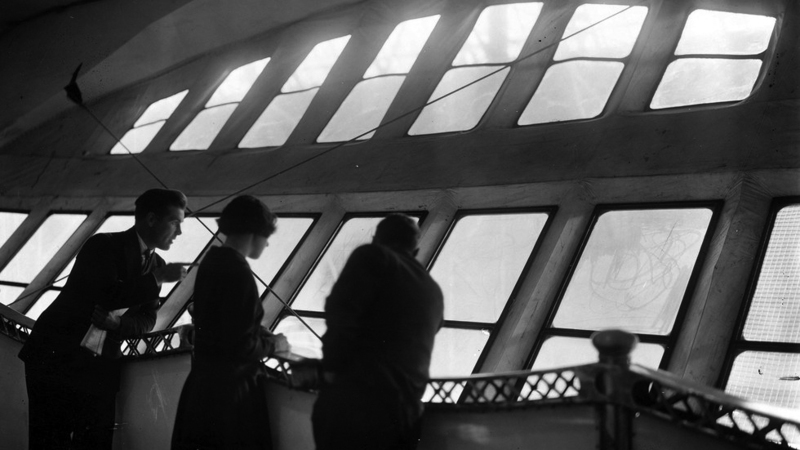 It crammed passengers and crew into a large forward gondola that extended partly into the ship’s frame. You can see its design and deck plan here. The larger LZ 130 Graf Zeppelin II moved passengers into the frame. While airships won’t be appearing in my writing anytime soon, I now understand the attraction. They’re an ocean liner in the sky, a home to their crew, and a hotel to their passengers. They’re not at all cramped. I can see why they’d be the transportation choice for pulpy adventures. Just make sure you have your ticket. Friday, Friday, FRRRIIIDDDAAAY! That means it’s time to share a few links I’ve found over the last few days. Some of these I mention on Twitter, if you’re not already following me there, please do! Have a link I should feature in the upcoming link pack? Let me know! All right, let’s get to it. My friend Brandie Heinel is moving to Tanzania to build an orphanage, foster home, and community center. She needs your help. Instead of buying that coffee or a beer today, please take time and donate. Do yourself a favor and listen to the latest short story from my friend Setsu Uzume over on PodCastle. If you’re looking for a steampunk romp with a little more punk, then you won’t be disappointed. Not only is the writing great, Amanda Fitzwater does an excellent job with the reading. Strange tale of an author seeking her biggest Goodreads critic. This was making the rounds for a while, but it’s worth a read if you missed it. Thanks to J. Rushing for suggesting I add it. Oh, and I should add, never, never, never do this. In which Hugh Howey asks the question: when will machines start writing books? Don’t think it could happen? Think again. It’s an interesting exploration on the advancement of artificial intelligence and humanities future. You’re probably aware that the old fairy tales were much different than the ones we know today. In the mid 19th century they were cleaned up for children and deviated significantly from the original stories. Well, good news! In the latest edition, those tales have been restored to their terrifying glory, and now I know what’s going on my Christmas list. In this series photographer Thierry Cohen explore landscapes we rarely see. Modern cities usually alive with artificial light, lit only by the stars. Switzerland-based illustrator creates fascinating imagery and landscapes within the texture of human lips. A book and short film made to celebrate Norwegian Fashion Week that goes above and beyond. Surreal and haunting imagery that is stunningly beautiful. Thanks to my own favorite painter, Kari-Lise (who else), for sharing this. As I said on twitter, I think Norway is going to win “Best Looking Passport.” Is that a thing? We should make it a thing. Here’s your fascinating archaeology news of the week, a 1300 year old manuscript deciphered. They claim it contains spells to cure possession by spirits and various ailments, or to bring success in love and business but let’s hope no one conjures up a First, eh?